Continental Carbon Group’s HIGH FLOW and VENTSORB® PE Series Odor Control Systems represent a perfect fit for odor control applications where space is at a premium and simplicity is a must. They have one of the smallest footprints of any odor control system, considerably smaller than most biofilter and wet scrubbing systems. Within this small footprint, Continental Carbon Group can provide a total package complete with fan, controls, and all of the accessories required. All the owner needs to do is make a few utility connections and flip a switch. 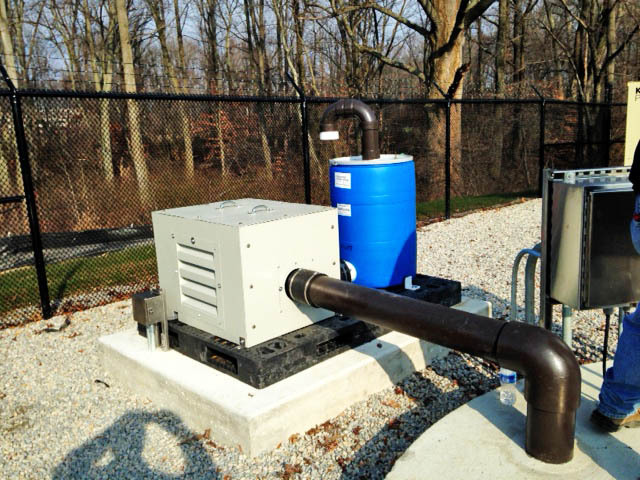 Due to their relatively small sizes, the HIGH FLOW and VENTSORB® PE are ideally suited for municipal wastewater collection system facilities such as pump stations and lift stations, where space is usually at a premium. They are also well suited to point source applications within the wastewater treatment plant itself. When filled with CENTAUR® HSV water regenerable catalytic activated carbon, the HIGH FLOW and VENTSORB® PE treat hydrogen sulfide (H2S), as well as, odorous organic sulfur compounds such as methyl mercaptan and dimethyl disulfide. For the treatment of low H2S and organic sulfur compounds, the HIGH FLOW or VENTSORB® PE can be filled with one of our other activated carbons. With higher levels of H2S, please consider our MINI-PHOENIX® PLUS and PHOENIX® odor control systems, designed for the control of heavy hydrogen sulfide loadings. For applications other than continuous operation at the design air flow rate, contact Continental Carbon Group for review and recommendation.